Millennials have rejoiced in popular culture’s transformation of science fiction books into block buster films. The films have acquired a devoted fan base and launched a series of “it” girls. Interestingly, these it girls showcase limited diversity. While saying that they all look alike is perhaps a tad overzealous, I will say that they share an obvious commonality as all are young women of the majority. While this sci-fi fascination arguably began with Harry Potter; Twilight marked the rise of the millennial it girl, or the single white female of science fiction. Twilight stars Kirsten Stewart as Bella, a young girl who falls in love with a vampire. This four part series made Kirsten Stewart a household name,creating a demand for this it girl. Amidst the end of the Twilight Series emerged The Hunger Games, starring X-Men star Jennifer Lawrence. The Hunger Games is set in a distopia that imposes a yearly battle between selected youth of the twelve districts, in which the sole survivor claims the victory. Katniss emerges as an accidental hero,taking the place of her younger sister in the battles. Divergent is the latest of these sci-fi films and bears a striking similarity to its predecessor. Like The Hunger Games, Divergent occurs within a divided distopia and features an accidental hero. The it girl of Divergent is small screen star Shailene Woodley. As the obsession of many millennials within and beyond the United States,Kirsten Stewart, Jennifer Lawrence and Shailene Woodley have soared into stardom. 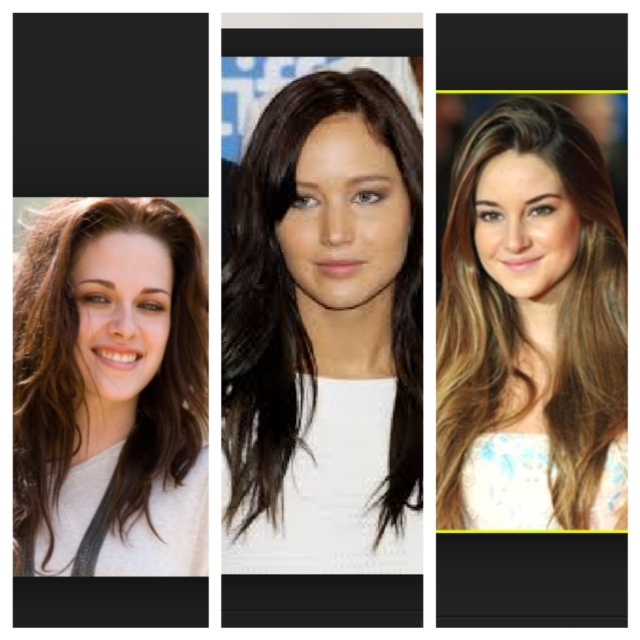 All three actresses also bear a similar look and demeanor, that both irk and captivate popular culture. All display what appears to be an indifference to their fame and bear (arguably of course) an approachable type of beauty, one that does not ooze sexuality and can be decidedly glamorous or plain. To contest my word choice of “Single White Female” some may reference Shailene Woodley to be of a multicultural background, as her mother is said to be of Creole origin. This information is certainly one of convenience as most African American and white people of the United States are of “mixed” origin. While the mixed lineage of blacks and native Americans were largely nonconsensual, the often under discussed mixed lineage of whites is due to illicit relations with Native Americans and enslaved black americans. This multicultural lineage, while present- fails to negate their status as white americans in a country that is built on the premise of white superiority. I would argue that this bit of information pertaining to Shailene’s ancestry is an attempt to diversify the it girls, without actually diversifying them. The very fact that this statement of Shailene’s ancestry can be furnished upon request, adheres to the privilege of white culture in America. My commentary is not to discredit Shailene or her ancestry, but to expose the ways in which the politics and race remain influential in popular culture. To adhere to the illusion of a post racial society, those bearing an appearance of the majority selectively claim racial ambiguity. Shailene’s past may paint a portrait of an ancestry that resembles Beyonce (who also has Creole origins), but the it girls of this genre cannot don this appearance. Why? Because even in this “post racial society” where the population has people of every color of the rainbow, our heroes can only be one shade. Commonly, all of these movies have the underlying theme of hope. Admist the hope for star-crossed love to survive, is the hope that the distopic world that encase these feeling will change for the better. Thus, these films further other the other through their depiction of the single white female as the epitome of hope. This assertion makes the presence of the other secondary if at all relevant, revealing the science fiction genre as yet another means to implement ideas of white superiority.